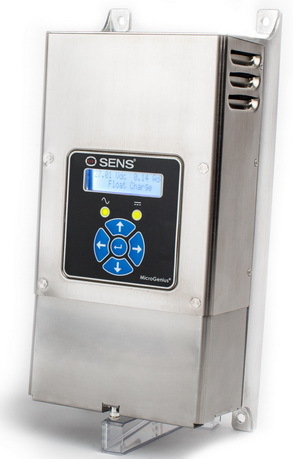 SENS today released a new keypad-enabled MicroGenius® 2 battery charger that allows users to control most parameters and functions of the charger from the front panel. The keypad-enabled MicroGenius 2 also includes a valuable new “battery check” feature, appropriate for stationary battery applications with a constant DC load. The battery check feature regularly assesses whether connected batteries are capable of powering the DC load. Battery check and keypad control functions were previously available only in the larger and more expensive EnerGenius IQ charger. Keypad buttons allow users to manually scroll through meter and charger status screens, to change operating modes, and to adjust operating voltages, alarm voltages, network connection parameters and other settings. Lockable access control can prevent unauthorized users from making parameter changes. Keypad and battery check-enabled MicroGenius2 chargers are shipping now. These enhanced features are available in all MicroGenius 2 power ratings, and are specified by using the code “F” in the “Alarm & Communication Options” portion of the MicroGenius 2 model number. See the data sheet for the MicroGenius 2 charger here.